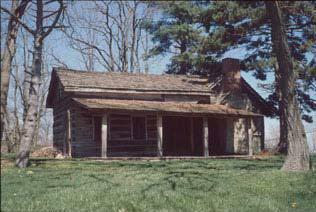 The Bacon Log Cabin (era 1835) was named for William Douglas Bacon whose family occupied it until 1889. It was situated on a vast farm of 700 acres which were farmed by slaves before the Civil War following the tradition of the family’s Southern heritage. The original home was composed of three adjoining cabins. The two remaining structures are connected by a “dog trot”. The east building facing Henry Avenue was a four room, two-story home composed of a living room and dining room downstairs and two bedrooms upstairs which were accessible by a flight of stairs. West of the dog trot was a one and a half story cabin which housed the kitchen as evidenced by the remaining flues in the ceiling. The upstairs, half story was probably occupied by the family cook. The use of the third adjoining cabin attached on the far west side has not been designated. Photographs evidence the original Bacon Log Cabin. The logs used in the building were cut from trees growing in the area. The foundation stones, chinking materials, and some of the plaster concoction were also gathered from the farm. Chinking was a mixture of small stones, straw, and mud which was packed between the logs for weather proofing and to prevent critter invasion. “Plastering” the walls was considered an elegant improvement. The finish coat was composed of lime and clay. When it was thoroughly dry, the walls were white-washed with lime and water. The architectural style and the way the two remaining fireplaces were constructed indicate that they were built to provide heat in a two-story building. Neither of them are deep enough to be used for cooking. One fireplace is made of stones which were probably gathered from the farm. One fireplace is made of handmade bricks which could have been made by the farm help, or they could have been purchased from Samuel Berry’s Brick Company which was opened in 1822 in the village of Manchester, Missouri. The cabin was given to Old Trails Historical Society in 1969 by Contemporary Homes. The owner, Fred Kemp, wanted to develop a subdivision on land where the log cabin is still on its original site. St. Louis County would issue a permit only if he preserved the cabin and he was not interested. His other option was to give it up to someone who would preserve it. Mr. Kemp gave it to a recently organized historical group – Old Trails Historical Society which was co-founded by Diane Broderick and Ettus Hiatt in 1967. There was a stipulation – the society had 5 years to restore and open it for public viewing. Members voted to accept it, restored it, created a museum, and met the requirements within the designated time. Major preservation projects have been done by members and interested volunteers. The cedar shake roof was applied by members under the guidance of Bill Grace. Walter Burkemper restored a north wall in the west cabin. That is when it was discovered that the supporting “beams” under the floor were huge tree trunks. Jim DiGiralomo replaced the existing porch. Louis DeFoe donated a furnace. Ed Horton did major repairs throughout the building. Diane Broderick enthusiastically spent many hours cleaning out the debris and chicken droppings and cobwebs with the help of many folks. William Douglas Bacon was born in Virginia to James and Martha Bacon. The family migrated to Missouri in 1823 to be near James’ father, William Bacon, who already owned a large farm at the southeast corner of the current Baxter and Clayton Roads. William Douglas Bacon was born January 13, 1813 and died February 6, 1892. He is buried in the family cemetery in Manchester, Missouri. He married Sarah Douglas Defoe in Manchester, Missouri who was born October 4, 1830 and died November 19, 1906. She is buried in Fairmont, Oklahoma. They had 8 children; 6 of whom passed away early in life – Amelia, Alice Elizabeth, Clarence Leander, William Henry, Eugene Lee, and Addie Leora. Two girls matured – Mary Emma Bacon married Truman C. Campbell, and Melcena Maud Bacon married David Stephens. The Bacon Log Cabin is a museum of West St. Louis County items of the 19th century. Old Trails Historical Society welcomes guests and invites new members to join at anytime. With continued community support, the Bacon Log Cabin can help tell the story of West St. Louis County for many years. Contact baconcabininfo@yahoo.com for membership information or tours. ​​​​​Bacon Log Cabin Tours will be the first Sunday, 2-4, April, May, June, September and October, 2019. Stop by and learn the history of the Cabin from our expert tour guides. ​if you would like a private tour. ​Trails Historical Society​ membership and events. Memberships may be mailed or sent to the PayPal link listed above. Old Trails is offering engraved commemorative bricks to be placed at the Bacon Cabin at a cost of $50.00. for ​information or to purchase a brick or mail your request to Old Trails Historical Society, P O Box 852, Manchester, MO 63011.